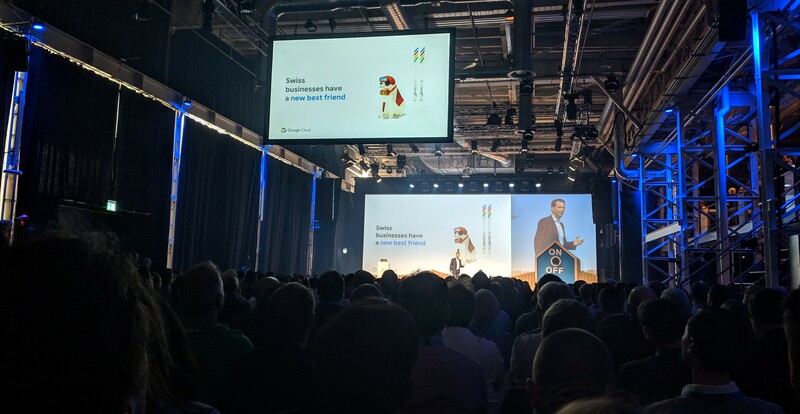 As expected, there was huge interest in the launch event for Google’s Swiss cloud region. Of course we were right there and took part in the Region Celebration, which was fully booked, and celebrated with Google when the switch was symbolically turned to boot up the data center. In this blog entry, you’ll find our review detailing the impressions the event left us with. “We are officially open.” Shortly after the starting signal, the first cluster was booted up symbolically within seconds. At the keynote event, several of Google’s clients and partners shared their experience and future prospects with the audience. The focus was squarely on regulated businesses such as banking and healthcare where Google’s entry into the market is seen as bringing huge opportunities, particularly when it comes to data protection, security, big data and machine learning. The exciting talks on the technical track as well as the business track were largely about the implementation of different applications such as Kubernetes, about best practices, and security — each talk was supported by real-life hands-on sessions and existing clients’ live cases. Those who did not want to join a talk could experiment in one of the many labs or exchange knowledge with others. We think the event was rather successful. We are very pleased that Google has entered the Swiss cloud market, and particularly with the great interest in Kubernetes which is an issue of great importance to us. We can hardly wait to see what the future with Google holds for us. You would like to know more about the public cloud or similar topics? Learn how container solutions make software development and implementation faster, easier and more reliable. How can the usage of containers support you and what possibilities does this technology offer you for process optimization? Find the answers in our new whitepaper.